Wishing Julie and Colin massive congratulations on their wedding which they celebrated at The Lawn, Rochford on Saturday 24th June. It made a huge change for me making cupcakes for a wedding but I really loved the way they looked on our cupcake stand. 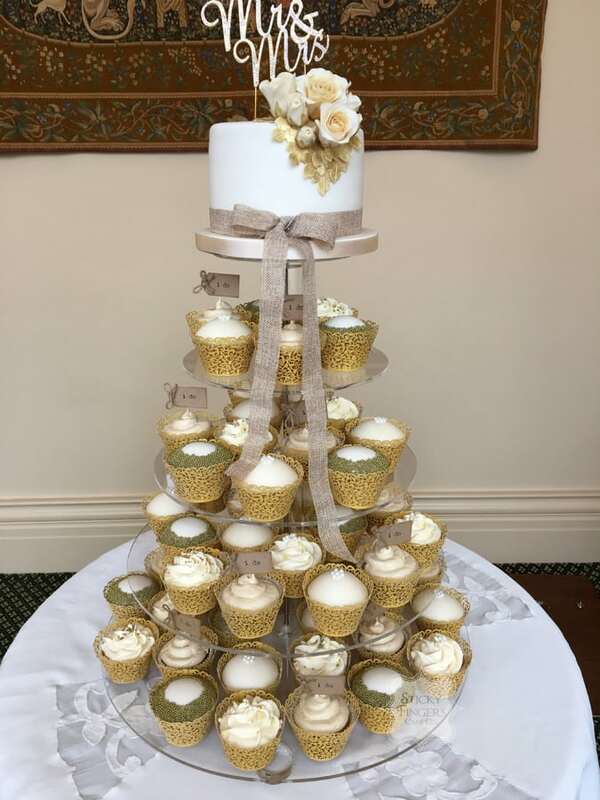 The colours the happy couple chose were beautiful – gold, cream, ivory and natural hessian – and I topped the cupcake tower with a cute 6” cutting cake decorated with a posy of cream and gold sugar roses, with a hessian bow to finish it off. They had 4 different flavoured cupcakes – lemon, orange, coffee and vanilla – with the cutting cake being lemon as well. We hope you had the most amazing day!